CASE: 40mm, Stainless Steel, screw-down pushers and crown, engraved tachymeter bezel, screw-down case back. DIAL: Silver dial with three black subcounters. Date aperture at 3 o’clock. 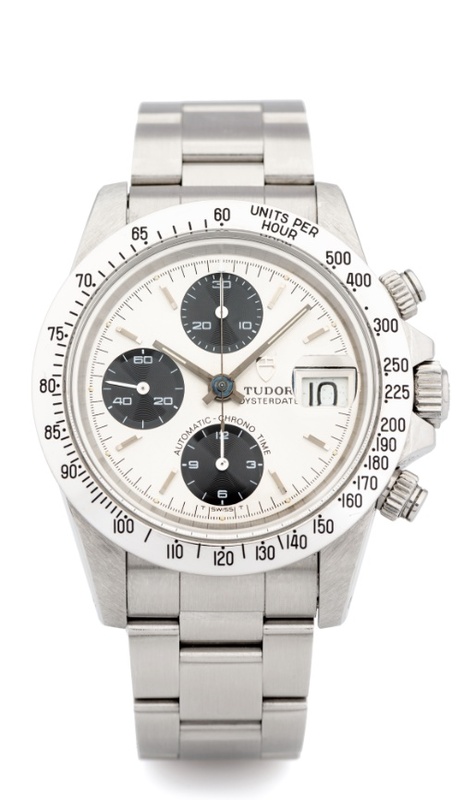 Luminous silver hands with silver central chronograph hand, white counter hands. Tudor Oysterdate printed & Shield logo applied on the dial. Automatic Chrono Time printed around the hours counter and T SWISS T at the bottom. CONDITION REPORT: The watch is 100% original and in mint condition. The movement functions are all working properly and the watch is running perfectly. NOTES: The Ecole d'Horlogerie de Geneve (Geneva Watchmaking School) is a public institution founded in 1824 as a vocational school for watchmakers. At the end of a watchmaking course, the student will assemble a watch from beginning to end including the movement and this watch will carry a special dial or caseback (as seen here). Patrick Conus is a chief watchmaker at Patek Philippe today, the neighbour of Tudor and Rolex in Geneva. He was in charge of training watchmakers at Patek and now works in the special workshop for tourbillon watchmaking.